In recent years, global investors have fallen into a trap of looking at trading friction as a key driver of their profitability, instead of looking at what really could/should drive assets under management – new investment ideas. And while trading costs and their minimization are important for any investment firm, these costs will never come close to solving the real problem of where to find “alpha.” Condoning a conflicted for-profit market structure, which maximizes ultra-short-term profitability, has had highly damaging repercussions to rates of return in the long term. Grant Thornton’s Kim and Weild eloquently demonstrate how stagnant global economic growth has resulted from the consequences of focusing much more on reducing these trading/friction costs than on keeping a vibrant public capital raising IPO process. Recently Edward Kim, Lisa Newport, and David Weild wrote an economic paper for the OECD that is a must read for any market participant. Titled Making stock markets work to support economic growth: Implications for governments, regulators, stock exchanges, corporate issuers and their investors, their paper links our market structure debate to the effect on IPOs and the real economy. Weild and Kim have made this argument since the May 6th 2010 Flash Crash, and they have done so to the SEC, Congress, and the Senate. Their argument/perspective was key in the formulation of the JOBS Act, signed into law in April 2012. Weild and Kim have documented the decline in IPOs in the last quarter century. They routinely point out how there were nearly 2,000 IPOs/year globally in the mid-1990s, and how that number today is closer to 750/year. They also point out that while economic cycles and Sarb-Ox have had a hand in there being fewer IPOs now versus then, those two factors don’t begin to scratch at the real reason for the decline – the rise of automated electronic intermediation, small tick sizes, and a lack of incentives for intermediaries to support and cultivate small IPOs. – Internalization by HFT firms has created a nightmare scenario for true investors. HFT firms can step in front of displayed limit order by mere fractions of a penny, depriving investors of fair executions. 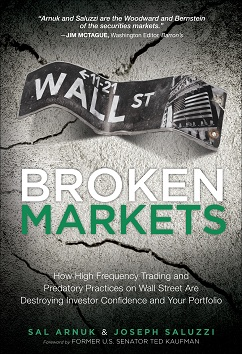 Investors cannot use sub-penny prices to enter orders, yet brokerage firms and HFT firms can—and do it constantly. – An examination of the IPO trends for all jurisdictions37 reporting listing activity reveals that (a) the dearth in activity in the United States is the largest contributor to the global decline in IPOs since 2001, while (b) Asian countries such as Hong Kong, China and South Korea have helped pick up some of the slack. – We estimate that, if not for the scarcity in public offerings, 3.1 million to 9.4 million additional jobs might have been created in the United States by companies after going public. However, if we assume a “multiplier effect” where higher IPO activity accounts for a like-kind number of jobs created in the private market (a conservative effect of only one for one), the range of 3.1 million to 9.4 million jobs jumps to between 6.2 million and 18.8 million jobs created. – It is not uncommon to hear challenges that the decrease in the numbers of IPOs is a misplaced concern, because alternative sources of capital have arisen to take the place of the IPO market. However, these arguments do not hold up when one considers that i) the private equity industry is largely confined to positive cash flowing companies (not venture capital companies) and ii) that venture-capital backed IPO exits are depressed, despite unprecedented amounts of venture capital invested, while the “gestation period” time-to-IPO for venture-backed companies more than doubled from 4.5 in 1998 to 9.6 years in 2008. – It turns out that GDP growth rates are a terrible predictor of small IPO productivity. The results of the linear regression yielded an R2 of only 0.11, excluding Poland, and 0.001, including Poland, which led us to conclude that this variable is a very poor predictor of a jurisdiction’s efficiency ratio for small domestic IPOs. By contrast, the amount of economic incentives in the aftermarket and the number of public companies within a jurisdiction yielded a strong predictive model. A multiple linear regression using these two variables and excluding Poland yielded an R2 of 0.71 and an adjusted R2 of 0.69. Please enjoy this work by Kim and Weild as much as we have.